Sandy Key’s beaches are forever protected by the neighboring National Seashore Preserve. If you prefer your walks on the beach, solely in the company of the sea gulls, Blue Herons and sea shells, then Sandy Key is the place for you. Sandy Key is located on 800 feet of Beach Front. This unit has 1495 SF of living area and a 200 SF beach front balcony. Ceramic Tile throughout Living, Dining, Foyer, Kitchen and Baths. Bedrooms are carpeted. Electronics include 50” SmartTV, DVD in Living Room, 32” TV in Master Bedroom, 20" TV in Guest Bedroom, and 19" TV in second Guest Bedroom. The ladies at Perdido Realty have always been friendly and helpful. 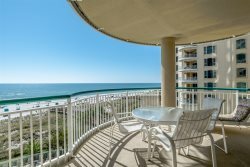 We love the condos we rent through Perdido Realty. We have used them for years. It's nice to have such an easy check in/check out process. As always, everyone was very friendly and helpful, another great experience!! This was our 4th year at one of your properties, another great experience! Our family had another great time. We'll see you again next year! Thanks again! Enjoyed our stay at an excellent resort property. The staff was friendly, courteous and efficient during the check-in process. The stay was excellent, except for the few minor inconveniences noted in the comments above.